If you’re heading to Badminton Horse Trials next week 4th-8th May in the Cotswolds, look out for our horse photograph below, which we will proudly be showing on our stand! We’ll be in the Rural Crafts marquee every day, except Saturday 7th May when our lovely helpers Emma and Dee will be manning the stand for us while we head to Somerset for a wedding photoshoot. Please come and say hi, we will be running a special offer on our equine photoshoots for the duration of the show. This is one of the images we captured on our photoshoot with the amazing Royal Andalusian School of Equestrian Art in Jerez de la Frontera, Spain, and this week its our ‘shot of the week’. We’re really proud to be taking it to the show with us as a framed artpiece, to share with you all. We spent a couple of days at the school capturing the stunning horses and riders – preparing for and then during a performance, behind the scenes and around the stunning location of the school. 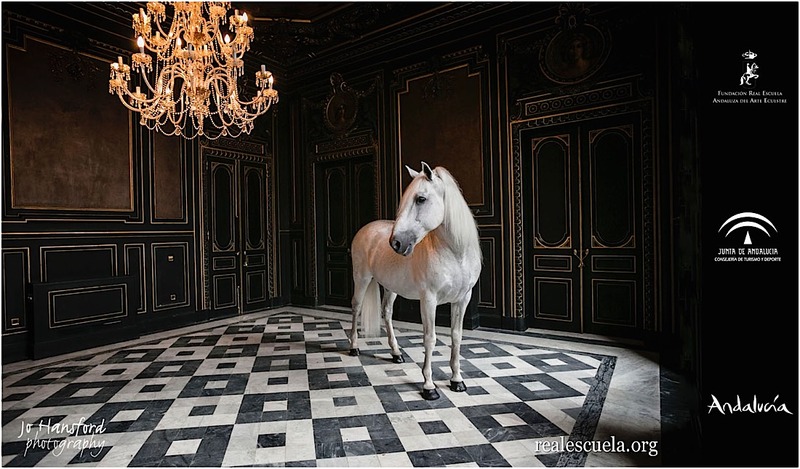 At the end of the shoot, we photographed this beautiful stallion ‘Vejador’ in one of the rooms of the ‘Palacio de las Cadenas’ at the school, with its magnificent chandelier. Vejador had to have his feet covered to protect the floor inside the room, and was of course suitably pampered and spruced up before he trotted up the steps to the palace. He took the whole thing in his stride easily and was very calm – such a beautiful horse! You can read more about this shot on our blog here – one of the images from this series was our Christmas card in 2014. Huge thanks to Sherene Rahmatallah of Sussex Lusitanos (www.sussexlusitanos.co.uk) without whom this photoshoot wouldn’t have been possible, and to amazing team at the Royal Andalusian School of Equestrian Art (www.realescuela.org/en/). If you’d like to see some more of our equine photography, head over to our portfolio here. Our standard half day equine photoshoot is £150 for the shoot, we also offer Yard shoots for £75 per person, min 2 people per photoshoot, these are shorter shoots of 2 hours – please just get in touch , email jo@johansfordphotography.com or call 07876344866 if you’d like to find out more or discuss a shoot.